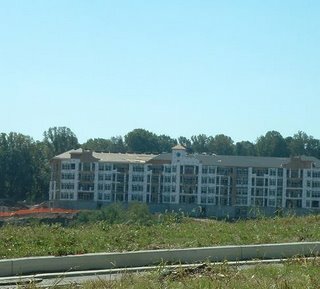 Dallas-based Centex Homes, which had offered 8,000-resident Warrenton, Va., a cash donation of $22 million to approve its request to build 300 homes on a 500-acre property, has backed out of the deal. Affordable housing supporters had called the donation a bribe, saying such projects drive home prices up and suburban sprawl farther into the country. But the town was delighted and intended to use the money to pay off debt on a new aquatic center. "It was kind of a win-win for everybody," said George B. Fitch, Warrenton's mayor. "I assumed that they had done their homework, that they saw the downturn coming and still thought it was a viable project." On Flckr "i couldn't get a good composition with the offending condos without facing the sun & getting destroyed by traffic, alas... P Street, east of Dupont Circle, Washington DC 12aug06." These stickers can be bought at PuffTags. As the housing market continues to decline and the consumer spending falls it will have serious ramifications for the overall US economy. These two factors combined with other factors will almost certainly to cause a recession in the US starting in late 2006 or early 2007. The first leading indicators of economic activity for October - the Philly, Richmond and Chicago Fed reports - are all consistent with a further economic slowdown in Q4 relative to Q3. I thus keep my forecast that Q4 growth will be between 0% and 1% and that the economy will enter into an outright recession by Q1 of 2007 or, at the latest, Q2. Billionaire speculator George Soros said he did not expect the United States to fall into recession in 2006 - but he does the following year. For the past 4 years the US economic 'recovery' has been too dependent on a mountain of debt. It was simply unsustainablele. The housing boom of last year is now a bust. The convergence of the housing bust with other significant economic factors will almost certainly put the US into a recession by late 2006 or early 2007. A most excellent comparison post: Percentage of Reduced Listings Per Market @ Bubble Markets Inventory Tracking. The sellers are really competing against each other in some of the bubblicious markets. HousingPanic and other housing bubble blogs were attacked in the mainstream media (MSM) "Blogs such as housingpanic.blogspot.com are helping to confuse buyers about everything from rumors to “bubble” theories." We housing bubble bloggers were ringing the alarm bells while people were busy engaging in bidding wars in summer of 2005. On May 25th 2005, I wrote "Behold the bubble is about to pop. The bubble will pop (price declines) within the next 12 months." The New Home Sales number are out for September (pdf). Sales of new one-family houses in September 2006 were at a seasonally adjusted annual rate of 1,075,000, according to estimates released jointly today by the U.S. Census Bureau and the Department of Housing and Urban Development. This is 5.3 percent (±15.6%)* above the revised August rate of 1,021,000, but is 14.2 percent (±12.2%) below the September 2005 estimate of 1,253,000. The median sales price of new houses sold in September 2006 was $217,100; the average sales price was $293,200. The seasonally adjusted estimate of new houses for sale at the end of September was 557,000. 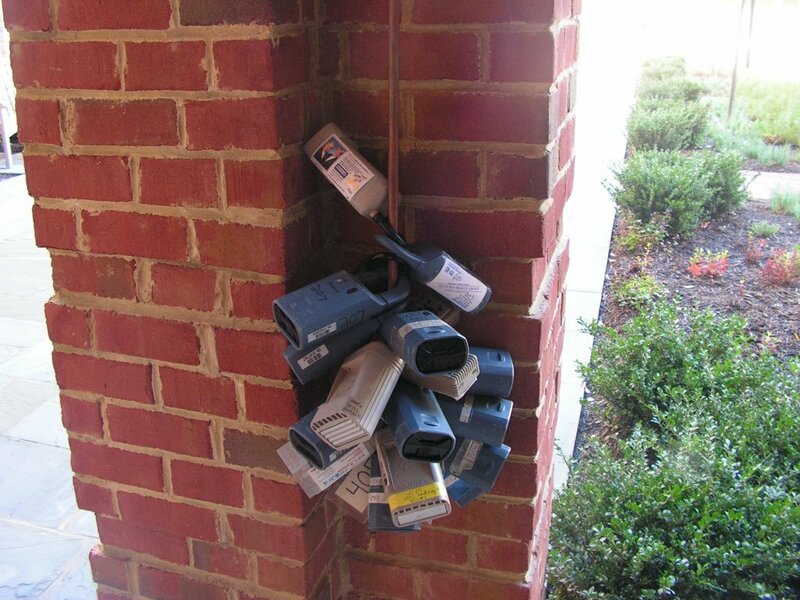 This represents a supply of 6.4 months at the current sales rat. The national median sales price for a new home in September was 217,100 which represents a decline of 9.7% compare to September of 2005 when the price was 240,400. The average sales price for a new home September was 293,200 which represents a decline of 2.1% compare to September of 2005 when the price was 299,600. Of course, in real dollars the percentage price decline is even greater. These numbers are a huge challenge for the Real Estate Industrial Complex (REIC) many of whom are spouting the 'soft landing' after the largest housing boom in US history. 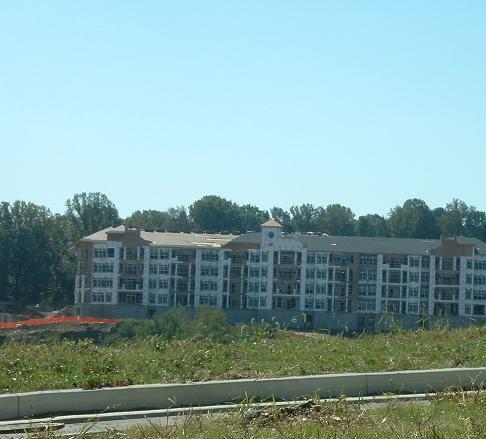 The Tuscany Condos are being built on what used to be my apartment building's (200 Yoakum Parkway) tennis court. 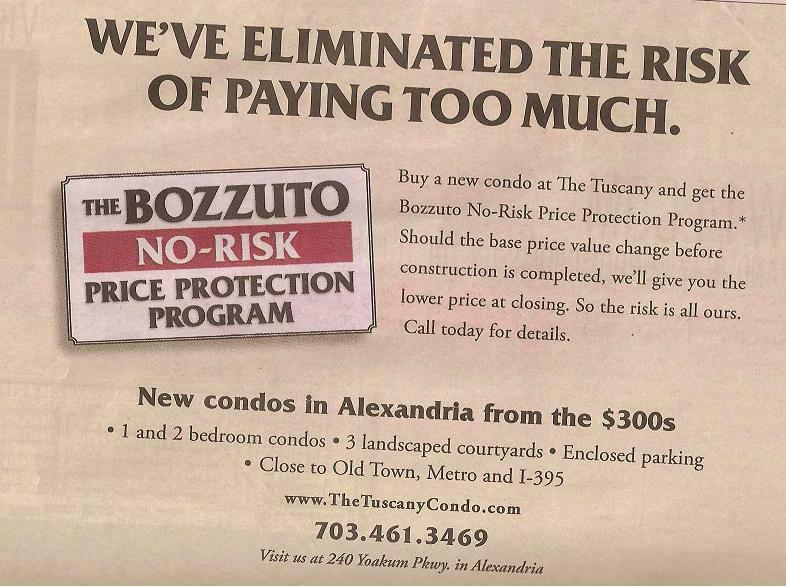 The Tuscany Condos were originally selling "from the $400s." 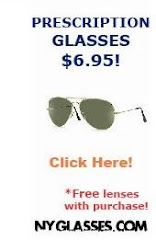 By the time you posted your article on them, the price had already been reduced to "the $300's." 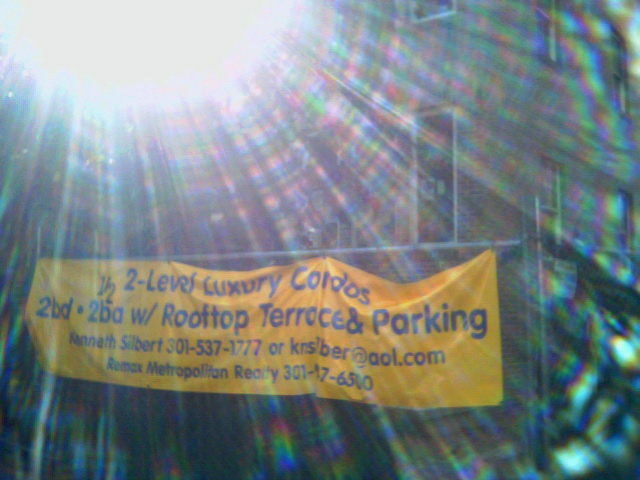 At the same time, my apartment building has been getting converted to condominiums. 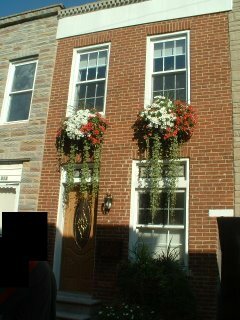 I had originally been offered a purchase price of $262,900 for my one bedroom apartment. (I turned it down.) 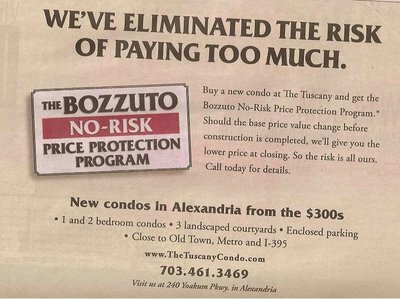 More recently, one bedroom apartments like mine have been advertised "from the low $200's." Because of my building's condo conversion, all of the tenants who didn't choose to buy have been told to move out. I am now one of the very few people still living in this very vacant building. (Finding parking is GREAT!) My eviction date is October 28th -- this coming Saturday. Last week, I found a new (and bigger) apartment elsewhere and signed the lease. I have been worried about being able to move all my stuff out on time, so I called and asked for a 3-day extension so I could have the whole weekend to move. A few days ago, signs were posted in my building saying the condo sales office had closed. 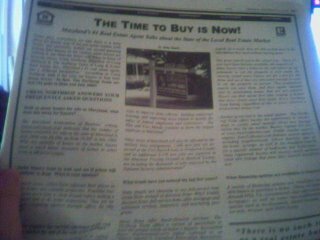 I was shocked that they could have actually sold all the condos in this declining housing market. Today, I got a call back on my answering machine regarding the 3-day extension, and I cannot believe what they told me. My building is "going to turn back to rentals. It is not going condo." I JUST SIGNED THE LEASE ON THE NEW PLACE! I HAVEN'T EVEN MOVED YET! 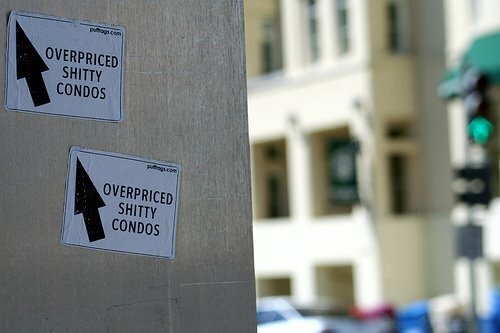 I haven't had a chance to ask, but I'm willing to bet that they couldn't sell nearly enough condos. 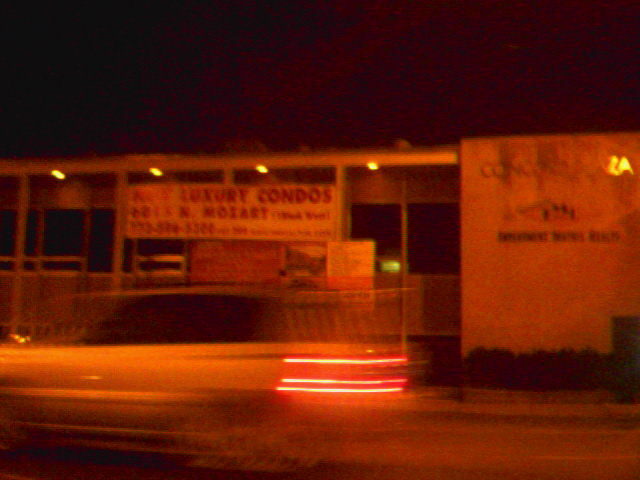 Months ago, I had bookmarked my building's condo sales website, strandcondominium.com. I even visited the site just a few days ago. So now, with the notice that my building is not going condo, I decided to visit the site again to see what it said. Well, it's gone! It has vanished into the ether. I'd say that clinches it. The bubble has definitely burst....but I still have to move if I want to avoid an expensive lease break fee on my new apartment. U.S. home resales fell 1.9 percent in September and prices dropped from year-ago levels for a second month, the first back-to-back monthly declines since 1990. Existing home sales fell to an annual rate of 6.18 million rate, the lowest since January 2004, from 6.3 million in August, the National Association of Realtors said today in Washington. Compared with a year earlier, sales were down 14.2 percent, the Realtors group said. Home resales have fallen every month since March. The median sales price fell 2.2 percent to $220,000 from a year earlier. Prices in August had fallen for the first time in 11 years. The number of homes for sale fell 2.4 percent from August to 3.75 million, remaining at a 7.3 months' supply. Nationally, the September median sales price is down 2.2% from a year ago. In real dollars that national is a decline of over 5%. The housing bubble has occured in many places throughout the US. These locales are enough to make national YoY price declines. 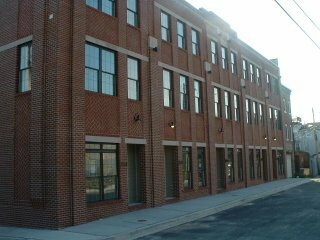 "Existing condominium and cooperative housing sales fell 3.2 percent to a seasonally adjusted annual rate of 763,000 units in September from 788,000 in August, and were 16.0 percent less than the 908,000-unit pace in September 2005. The median existing condo price was $219,800 in September, which is 2.8 percent lower than a year ago (NAR)"
"The worst is behind us as far as a market correction _ this is likely the trough for sales," said David Lereah, the Realtors' chief economist. "When consumers recognize that home sales are stabilizing, we'll see the buyers who've been on the sidelines get back into the market." Another inane comment by Mr. Lereah. Consumers care far more about house prices stabilizing then 'home sales stabilizing.' Prices will continue to fall in the bubble markets over the coming years. Don't be fooled by David 'Paid Shill' Lereah. Thank goodness for Kenneth R. Harney. Finally, someone has pointed out that this minor, much-needed adjustment in the local housing market is beneficial ["All Crashes Should Be So Good," Real Estate, Oct. 14]. All of this media brouhaha about a plummeting real estate market discourages the very people who most need the financial security that owning a home provides: first-time buyers. Daniel Mudd, chief executive officer of Fannie Mae, told the conference that the payment shock accompanying many monthly mortgage bills would have a profound impact on the housing industry next year. He said that out of $9 trillion in mortgage debt outstanding, roughly $1 trillion will reset in 2007. "Those resets are going to have some interesting and difficult-to-predict impacts on consumers," Mudd said. The lending companies have been grossly irresponsible in peddling these suicide loans to ill informed borrowers. There has already been an explosion in foreclosures, and the worse is yet to come. The pain of the toxic mortgages will become much more evident as we approach the summer of 2007. There are countless books offering advice on making money in real estate. This is the first one to explain why knowing the ins and outs of your local region is essential to deciding when, and where, to buy. 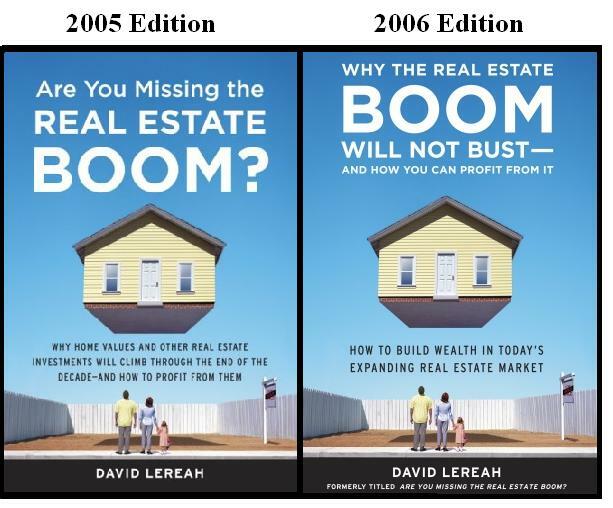 Even in 2006 as the housing bubble was deflating, David Lereah updated his book and wrote "I believe that in years to come historians will see the begginings of the twenty-first century as the "golden age" of real estate. And I want to persuade you to take advantage of this historic opportunity. In the first part of the book, I will paint a clear picture of today's real estate boom and explain why the boom will continue well into the next decade." The boom did nbot continue. The housing market in the bubble markets are undergoing significant declines. His main predictions have been totally discrested. Mr. Lereah tells half truths and manipulates facts and figures. He cannot be trusted as he is a paid shill. The number of Realtors has been booming over the past 5 years. See a post from about a month ago Is there a Realtor Bubble? The percentage of growth is slowing down as we head in to the real estate decline. In economically depressed Michigan the number of Realtors has declined 3.72% from September 2005. The Federal Reserve Board is having its next meeting on October 24 - 25th. During the past two meetings the Federal Reserve has paused held short term interest rates steady. Will they pause hold rates steady once again? Inflation Worries. As "readings on core inflation have been elevated, and the high levels of resource utilization and of the prices of energy and other commodities have the potential to sustain inflation pressures." Recession Fears "The moderation in economic growth appears to be continuing"
Don't want to cause a meltdown in the housing market. As the housing market activity is already "cooling considerably"
It is very likely that captain Bernanke will, once again, hold rates steady later this month. They are in a very tough position. The National Association of Realtors (NAR) has just started certifying Resort & Second-home Property Specialists (RSPS). "RSPS certification will appeal to REALTORS in resort and second-home markets around the world who wish to distinguish themselves amongst their peers and amongst consumers. NAR currently defines a REALTOR specializing in resort & second-Home markets as “a real estate practitioner who facilitates the buying, selling, or management of properties for investment, development, retirement, or second homes in a resort, recreational and/or vacation destination.” Here is their FAQ. New Construction Report @ Paper Dinero. 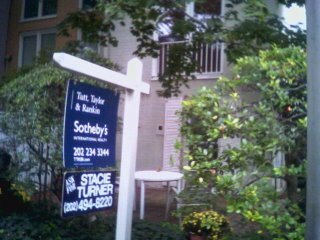 The high rates for new home cancellations in the Washington DC Area are contributing to the rise in new home inventory. NVR Inc., the region's largest home builder, said yesterday that four out of 10 of its new-home sales in the Washington area were canceled last quarter, making it the latest builder to report that more buyers are backing out of deals. Around the Washington market, cancellation rates have tripled in the past year, to 17 percent, according to researchers at Hanley Wood Market Intelligence. In August alone, that meant about 250 cancellations. In its most recent earnings report, builder Toll Brothers Inc. said cancellations in the quarter that ended in July had more than doubled, to 18 percent nationally, while numerous builders said in interviews that their cancellations locally had increased. Some are abandoning their contracts even if they have significant deposits. "Buyers are abandoning five-figure deposits on their future homes because they cannot sell their existing homes or did not sell them for nearly as much as they had counted on." Here is one opinion about real estate proffesionalism. Some what Mr. Marguleas says makes sense, much does not. Anthony Marguleas, broker and owner of high-end realty firm Amalfi Estates in Los Angeles, thinks the industry shouldn't be spitting out low-producing agents. Instead, it should be harder to become one. Marguleas researched the number of hours it takes to become a licensed real estate agent, which varies by state. In California, he says, getting a license calls for a 45-hour class. Nationwide, the requirements range from a low of 24 hours in Massachusetts to a high of 120 hours in Ohio, according to ARELLO. He says it takes 9,000 hours to become a doctor and 1,600 hours to become a cosmetologist. "To dye someone's hair it takes 20 times more studying than to help someone sell the largest investment of their life," he says. "Real estate agents typically get ranked right around used-car salesmen. The bar is so low to get a real estate license," says Marguleas, who operates in a high-end market in Pacific Palisades, Calif., and has been in the real estate business for 15 years. "I would love to make it as hard as it is to become a doctor or lawyer to raise the professionalism. So many people who do this are part-time and not very knowledgeable about what they're doing. It's why consumers have such a poor image of real estate agents." How can real estate agents as a group garner more public respect when they are lead by discredited shills like David Lereah? (that was a rhetorical question) Also, I don't agree that it should be as hard to become a real estate agent as it is to become a doctor or lawyer. The new monthly numbers for September 2006 are out from the MRIS the multiple listing service for the area. YoY = Year over Year, that is the comparison between September 2006 and September 2005. These numbers include all housing units ( not just single family residences but also condos and co-ops). Please note: The median price in DC was $455K in September 2006 which was a huge jump from August 2006 was $397k or July when it was at $415K. I am not sure what caused such a dramatic increase in the median in DC. If you have a theory please post. Verify it using stats from MRIS. For more numbers on jurisdictions not mentioned here please go to MRIS Market Statistics. The housing market in the Washington, DC area is experiencing a significant decline. The above numbers are nominal dollars, looking at real dollars (inflation adjusted) the dollar declines are even greater. The real estate agents must be hurting now as the total dollar sales volume for Northern Virginia is down 38 compared to September 2005. The market will continue to decline as we head into the fall and winter months. The spring / summer boom, which many in the housing industrial complex had hoped for, failed to materialize. 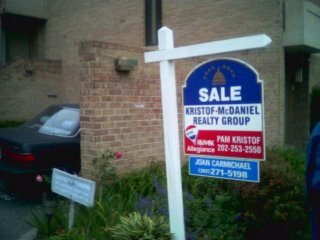 In the metropolitan DC area a declining housing market is reality. We know Florida is bubblicious. Now, it is the leader in foreclosure activity. Florida is leading the nation in foreclosure activity, according to a report by Bargain Network. The report said that Florida has approximately 28,000 properties in some form of foreclosure, accounting for 27 percent of the nation's total. With one new foreclosure filing for every 254 households, the state's foreclosure rate was more than four times the national average. Yikes! Expect the foreclosure rate in Florida to rise further. Florida's homeowners are especially vulnerable to foreclosure because of high hurricane insurance rates. 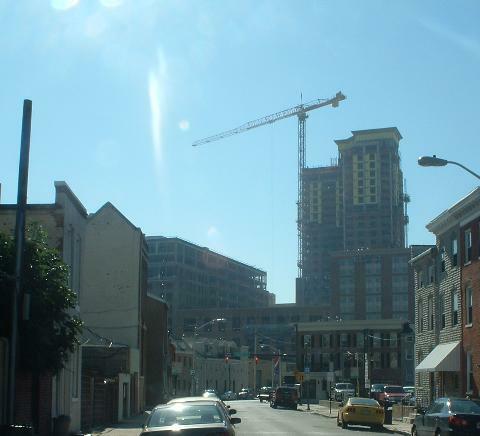 The Real Estate Industrial Complex bears a large degree of responsibility for this debacle. Keith's Housing Panic Blog has two wonderful posts attacking the REIC (Real Estate Industrial Complex. 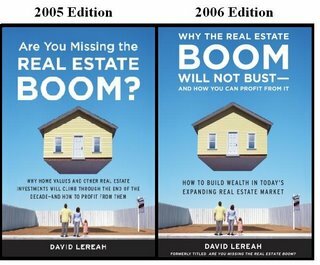 Realogy (owner of Century 21 etc) launches housing bubble propaganda counter-attack and another post one attacking the fully discredited David Lereah. "It's been amazing (and funny) to see the corrupt David Lereah spin lately. Now he's a the "we've been anticipating a price correction" stage of lying." It is impressive how often Keith posts on his blog. If you are addicted to the housing bubble news there is now a Bubble News Network (BNN) which features video news. Excellent! Today, a friend and I traveled to bubblicious Baltimore. 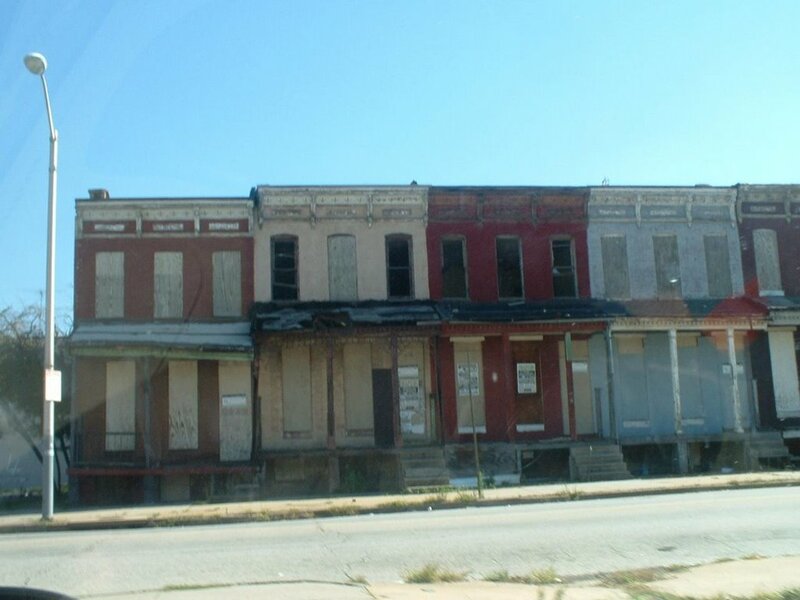 According to the OFHEO 2Q government report the 5 year price appreciation rate for the Baltimore, MD metropolitan area is 99%. 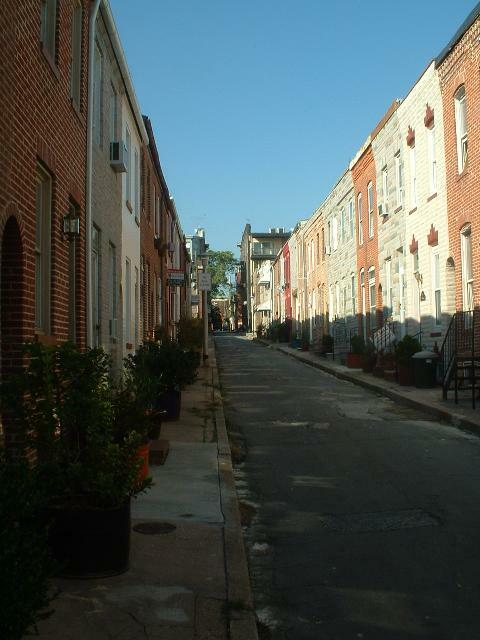 The charming 300 block of South Madiera Street in the Butchers Hill neighborhood. 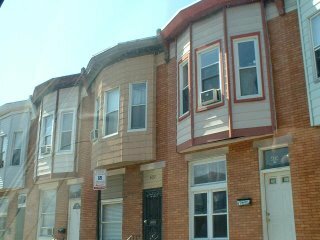 There are 5 rowhouses for sale on this block. Lovely rowhouse NOT for sale in Butcher's Hill. 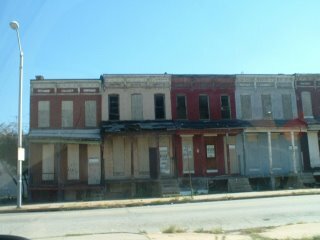 Rundown houses in Baltimore. 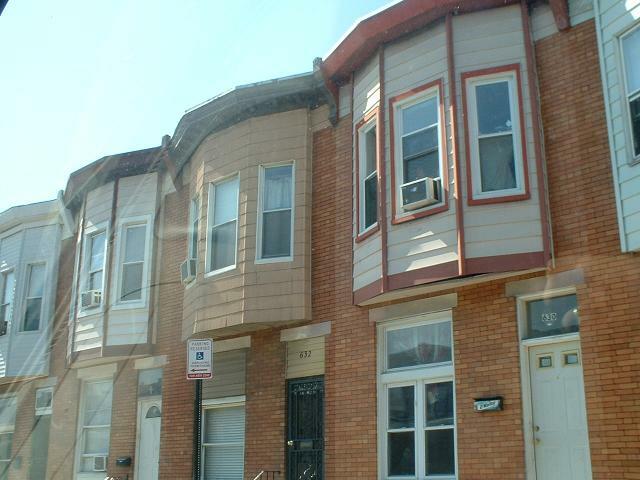 Incidentally, there was an onsite public auction for a rowhouse about two blocks from here. 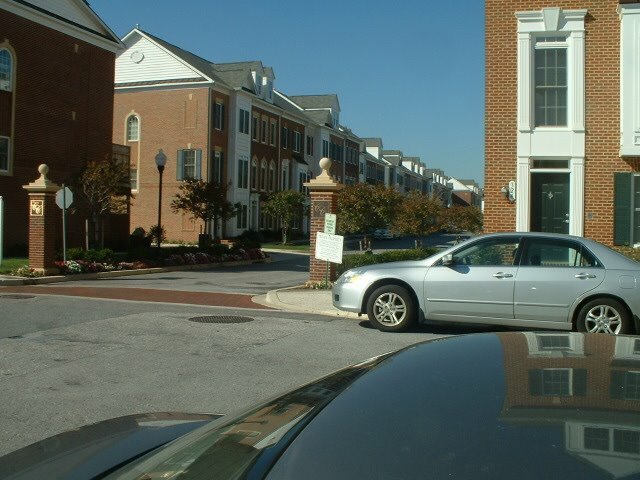 500K rowhouses in Butcher's Hill located. David Lereah, chief economist for the National Association of Realtors, disagrees with the severity of the price downturn in the report. "It's possible we could go under zero, if you include prices of new homes" along with sales data for existing homes, he said. "For existing homes, I'm still predicting that prices will be above [last year] by 2 percent." Nonetheless, Lereah agreed that broad price declines in some regions are unavoidable. "I don't think I would use the word `crash,'" he said. "When you use a word like that, it's almost a self-fulfilling prophecy in the housing market. These are people's homes. Their retirement is depending on it." Mr. Lereah, you were one of the housing cheerleaders who encouraged people down this dangerous path. You even wrote two books promoting the housing boom. As Ben Jones wrote "Maybe the NAR should have been urging caution the past few years instead of cheering prices higher." 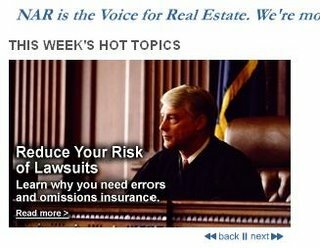 Supreme Court Justice Louis D. Brandeis: "Sunshine is the best disinfectant"
The National Assocaition of Realtors (NAR) released 100 Market-by-Market Home Price Analysis Reports for August 2006. "Get insight into the fundamentals and direction of housing markets in 119 of the nation's largest metropolitan regions. Each of the 11-page downloadable market reports evaluates a number of factors affecting home prices:"
"These reports reflect data available through August 2006." I have not yet reviewed these reports. More to come. Reader comments on these reports is highly encouraged. Hopefully they will be better then the discredited anti-bubble reports. NYSUN: 'For Real Estate Brokers, Business ‘Has Dropped Dead'"
The New York Sun reports that For Real Estate Brokers, Business ‘Has Dropped Dead' . Veteran real estate broker Deanne Esses, who plies her trade as a senior vice president at one of the city's biggest firms, Bellmarc Realty, said eight people in her Upper East Side office on Madison Avenue are leaving their jobs for alternative careers. Those eight represent 20% of the office's sales staff of 40. That's only the beginning. Ms. Esses said she thinks more New York City brokers will be leaving the scene. 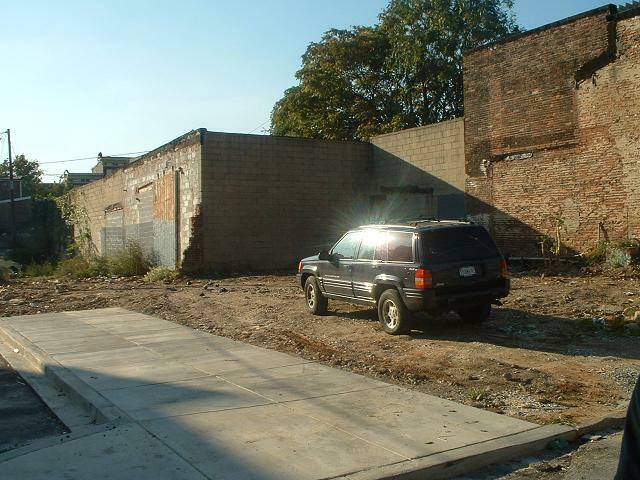 "Business here is just not quiet; it has dropped dead over the past few weeks," she said. "At the same time, there's a flood of inventory on the market. We run open houses, we run advertisements, but nothing works. There are no buyers, and without buyers, there are no sales." Now read about the newbie real estate agent who quickly went from almost 200K a year to flipping sandwiches in Queens. Wow! Early in 2004, Mark Clemente left his uncle's dry-cleaning plant in Detroit to go east and, hopefully, make his fortune in real estate. Shortly thereafter, he became a broker at E&G Realty, a small firm in Newark, N.J., where he earned a respectable $195,000 in his first year. But it has been downhill ever since. The housing slump and fierce brokerage competition led to the demise of E&G. Mr. Clemente's income collapsed, and over the past six months he has held a number of part-time jobs, including one making sandwiches at a Queens delicatessen that paid him $100 a week. "I'm going home; my real estate career is over," he said the other day. Now as the market continues to decline there will be many more people leaving the housing industry for other prospects. The bubble was unsustainable and the wreckage will leave the US economy in a state of recession in 2007. The full ad can be seen here (pdf). Hattip to the reader who dound the link to the ad. The housing boom has clearly ended in the vast majority of the bubble markets. We are now seeing some price depreciation. Last summer there were four basic opinions as to what will happen in the bubble markets going forward. 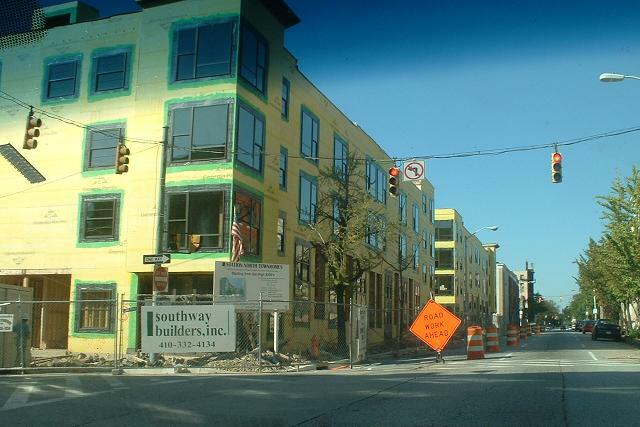 The housing head argument that the boom will continue has proven false. So which of the remaining three options are we likely to see in the bubble markets? How much will prices fall in real dollars (inflation adjusted)? I see a hard landing happening in many bubble markets, with some bubble markets experiencing a crash landing. The time period between peak real dollar price and bottom real dollar price will probably be between 4 - 8 years.